Nobody wants Tulip in their gang. She skives off school, cheeks the teachers and makes herself unpopular with her classmates by telling awful lies. None of this matters to Natalie who finds Tulip exciting. At first she doesn't care that other people are upset and unnerved by Tulip's bizarre games, but as the games become increasingly sinister and dangerous, Natalie realises that Tulip is going too far. Racing, in fact, to the novel's shocking ending. Reissued for the Originals series of powerful teen fiction. Wirral Paperback of the Year, 1998. In the USA, The Tulip Touch was chosen as an ALA Notable Children's Book; the Booklist Editor's Choice - "Top of the List" Fiction; Bulletin , Blue Ribbon List, 1997; School Library Journal 's "Best Books of '97"; River Bank Review "Children's Book of Distinction", Arizona Library Association Young Readers Award 200 Nomination. 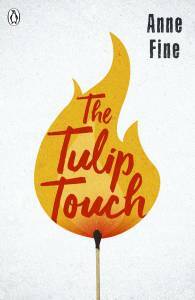 "The Tulip Touch grapples with the topical question of what turns children into criminals. It engrossingly chronicles a childhood friendship with a disadvantaged girl who goes to the bad. This novel will make children aged between 11 and 14 think about the dangers of peer pressure and the collective responsibility of society for unhappy children. As always, Fine teaches her lessons by making her readers feel." "The peerless vigour of Fine's writing, and the provocative question of whether our society is even trying to catch its 'evil' ones as they fall, make this an extraordinary powerful novel. "Tulip is the violent child about to crack, the child who echoes famous cases in our recent news. What elevates this subtle telling is that Fine manages to convey sympathetically the probable reasons why Tulip is the way she is." "Anne Fine uses simple prose to great effect. The language is usually more dramatic and economical than descriptive. Every sentence is precisely constructed to ensure clear meaning."